I’ve always loved maps, and to this day collect paper maps pretty much whenever I can. One thing about modern technology though; Google Maps is pretty amazing. Whenever I travel I like to look at Google Maps and just see what I can find. I’ve found many small and interesting roads by going to around a 10,000 foot view and scanning Maps around the general area I’m staying. I always set the mode to Hybrid (Satellite plus road labels) and it’s amazing what you can find. Then, using a laptop, I map out routes and save them so I can access the information easily when out on the road. 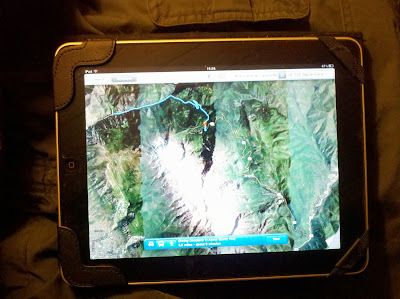 Using my 3G phone, I use the mobile maps to follow routes that I have mapped out. Even better, if you have a 3G/4G tablet, the screen is even more useful. Not while driving of course, but I will occasionally pull over and pull up the map and verify my location as well as where I am in my travels. If I am driving with a navigator, it’s like having digital pace notes right at hand. Sometimes modern technology in the car is too much; sometimes it’s cumbersome (and downright dangerous); but sometimes it’s also quite useful. A 3G/4G tablet is an incredible tool in the hands of a skilled navigator (the one not behind the steering wheel) for finding those little roads that you never knew existed while out in unfamiliar places. It’s amazing the roads/routes I’ve found this way. The best part of using Google Maps Navigator? It doesn’t talk (by default, anyway).